Everyone likes Q&A formats, right? Information systems management and it’s worth noting that everything contained in this document is sort of specific to my field. Other fields will have similar processes and cognates, but eventually the specifics end up being unique to a given field. How do you find out about academic jobs? Depending on the field, there may be different sources of information. My primary sources were a list-serv mailing list put out by the Association for Information Systems and the same organization’s website. Word-of-mouth also eventually played a role. Are all the jobs basically the same? Yes and no, of course. Yes in that almost all tenure-track positions require some combination of teaching and publishing and in that in almost all cases you have about six years to prove yourself as an assistant professor before your tenure case is reviewed. After that, we start getting into some no. There are different tiers of departments that range from research-focused to teaching-focused. The research-focused jobs tend to be those that pay better and are considered higher-prestige (to an extent that on occasion can seem a little uselessly destructive). They usually require more publications in “better” journals to reach tenure, but also tend to have lower teaching requirements. Also, there’s a lot of variance among departments in terms of how research- or teaching-focused they are. The most research-focused also generally have PhD programs and are rated highly for their research (e.g., by the Carnegie something or other ranking system). For some reason, most universities with big-time football programs tend to also be major research universities. It’s worth noting that a given department’s focus (whether more research-leaning or teaching-focused) is not necessarily dependent on the university’s research profile as a whole. Teaching schools tend to be the liberal arts schools and the state schools named after cities or with compass directions in their names. This is not at all an absolute, but it seems to trend that way. Something I’d like to point out is with a lot of jobs, the idea of relocating may become a possibility, especially if you offered your dream job. At first, this idea can seem daunting, but it will work out in the end. Take moving to North Carolina for example! If you have applied for a position in around this area, potentially the best thing for you to do would be to look into something like essex homes columbia to be closer to your work place. That’s if you don’t mind the daily commute. These are just something things you will need to consider when you are looking for a job, even with academic careers. How much do new (tenure-track) faculty have to teach? In most cases, new assistant professors at top research schools (in my field) are expected to teach a “2-2 load” (meaning they’re required to teach two classes in the fall semester and two in the spring). Many schools lighten this for the first 1-3 years by requiring only a “1-2” load, however, to help new professors focus on publishing. That said, not all teaching assignments are the same. If a new professor has a 1-2 load, but is required to teach three different classes that change every year, each of which have 200+ students, that’s a considerably heavier load than someone has who is teaching a 2-2 consisting of the same course each time with 20 students per class and ready access to a pool of graders and/or teaching assistants. Outside the “top research schools”, teaching requirements generally get heavier. It’s not weird to hear about 3-2 loads, 3-3 loads, or 4-4 loads, depending on the school’s profile. How do you know what kind of job you want? I’m not sure you do before you have the job and find out. I have definitely met PhD students who “knew” what they wanted during their entire time as PhD students, but I think that’s mostly down to ego (either Type A and have to have the prestige or self-doubters who don’t think they’re good enough or dedicated enough or whatever to handle the rigors of a top school) with a good deal of confirmation bias thrown in. If you start out at one kind of school can you move to another? From what I’m told, it’s relatively easy to move to a less research-focused school, but difficult to move to one that’s more research-focused. In other words, if you start at a research school you can reasonably readily go to a teaching school, but you can’t expect to go the other way around. That said, mobility has more to do with your research publication success than anything else and it’s certainly possible to get yourself widely published while working at a more teaching-focused school. However, the more time you’re required to teach, the less time you have for research. Further, if you are in a faculty without a lot of serious researchers, you have less access to co-authors and collaborators than does someone working in a faculty that is research-focused. For those reasons more than any sort of prejudice against “upward” mobility (IMHO), it’s difficult to move from a lower research school to a higher one. So then are all the research-focused jobs basically the same? Not really. First, every department has its own sub-focus. In my field, there are two major research camps: behavioral and econometric. In many cases, IS departments adhere to either one or the other of these (i.e., either all faculty in the department perform behavioral research or all faculty in the department perform econometric research). Within these, there are a number of sub-camps based on methodology (e.g., experiment, archival data, economic modeling) and/or topic area (e.g., software development, IT usability, IT economics). Not quite. For example, working on the Application Development Tools from Salesforce is a lot different than working on Microsoft based software. Usually, departments are looking for applicants who research topics similar to theirs and are not looking to diversify themselves with regard to research interest. While on the one hand this seems to run almost counter to what you expect a university should want, there are practical reasons why this isn’t necessarily a bad thing. Particularly from the standpoint of a new faculty member, who needs to create publishable output, having senior faculty with similar interests who are available locally can (I’m expecting) be extremely helpful. I do personally wonder whether better and more interesting research would begin appearing if this wasn’t the case (e.g., if behavioralists and econometricians more regularly interacted and learned from each other). I’m going to wait until I’m tenured and well-known in the field before I tackle that issue though. Academic disciplines have many of the positive and negative characteristics small towns. How does the job-getting process work? When do you apply and interview? This varies significantly by discipline. For instance, in the marketing area, interviews occur about a year in advance of the prospective start date, with job offers being given soon thereafter. I have a colleague in the marketing department who got her job in (I think) October and will start the job this coming August. The process has four main steps: (1) application, (2) preliminary interview, (3) fly-out interview, and (4) job offer. In my field, job postings begin appearing mid-summer and new jobs continue to be posted as late as January. Thus, applications are submitted starting in mid-summer. Applications are often talked about in terms of an “application package”. This package generally consists of a cover letter (specific to the school hopefully), CV (your resume showing all your publications, conference presentations, teaching experiences, successful grant applications, etc. ), research statement (what you have researched, what you expect to research), and teaching statement (what you have taught, how well you taught it, and what you hope to teach in the future). Based at least a little bit on your application package, schools then invite candidates for a preliminary interview (usually). Although more and more preliminary interviews are occurring via Skype, traditionally these have occurred (in my field) at one of two conferences: AMCIS, which usually takes place in the United States and is held in August, and ICIS, which can be held anywhere in the world and is scheduled for December. ICIS is typically/historically the marketplace for the more research-oriented positions, while AMCIS is usually the province of the teaching-focused positions. This timing creates a bit of a conundrum for some job market candidates, since the teaching schools sort of have “first dibs” on candidates, who may be expected to make a decision about a job offer before the research school job market has really kicked in to gear. That all said, any type of school can start interviewing at any time and at any reasonably relevant conference. These interviews are usually with at least two members of the hiring committee and often are with the entire committee (I think five was the max number with whom I preliminarily interviewed). I think the interviews I had were all meant to either (a) see if I was really the person my CV implied I was or (b) force members of the hiring committee to actually look at a few lines of my CV. I don’t mean that second one quite as cynically as it probably comes across. Most of the questions are generic (what have you researched? what have you taught?). In the case where this really is the first time they’re looking at you seriously, what they want to hear is that you’re a good fit with their department — that you research things that agree with the interests of existing faculty, that you want to be at their kind of institution (e.g., that you really want to be at a teaching school and that you’re not just using them as a back-up in case you don’t get the job at MIT), and that your personality isn’t a problem. When applying for jobs, businesses do background checks on potential employees. Looking into something like a national police certificate would be a quick and easy way to obtain criminal history checks. If you pass those thresholds and your background is strong enough, you’ll then maybe get invited for a fly-out. This is where you visit the campus for a day or two (the interviewing school pays travel expenses), interview with all the relevant faculty (half-hour interviews, very benign-seeming), interview with the dean of the school (unless the dean is out of town), and give a 90-minute presentation of your research followed by a Q&A. If the school has PhD students, you’ll also probably meet with them (they may also be the ones asking most of the questions during your presentation). In my field at least, schools usually seem to invite their top three candidates for the fly-out. While all faculty interviews are important, as alluded to earlier, most schools have a “hiring committee” that consists of a sub-set of the faculty. Members of this committee are those that eventually make the final recommendation/decision. Both fly-outs I had included a real estate tour, which I think is pretty common also. You’ll hear back from the school in one to x weeks, where x might be infinity. I’m sure it has happened before, but no matter how well you did at the fly-out, the school is not likely to make you an offer before you get on the plane home. They have to interview all their candidates, have committee meetings, talk to their dean, etc. I had two fly-outs and received two offers. One came about a week after I got home and the other about five weeks. In the latter case, I had assumed that things at the fly-out must not have gone as well as I thought they had, but I was apparently mistaken. I would guess that most of that lag time has to do with bureaucratic issues, although it’s also possible that the time would get extended if you’re not the #1 choice, but they still might want to hire you if their #1 choice turns them down. Once you get an offer, you’re expected to give them an answer in a week or two. This can be a little tricky if there’s some school out there that you’re hoping will offer you, but you haven’t heard back on a fly-out yet. I didn’t have that issue, but it’s not an uncommon one. The job market (my field specific) is mostly played out by March for jobs starting that upcoming fall. Also, just in case any of this sounds cavalier or preposterous (I can imagine a humanities or physics PhD viewing some of these statements with incredulity), the market for new PhDs in business disciplines is relatively good. New graduates don’t always get the job and salary they want, but they usually get a job and a salary, which I know is pretty different from experiences in a lot of areas. In IS Management in particular, this last job cycle was the best one (for job seekers) in at least four years. What things signal “fit” to hiring committees? Research departments want to see that you’ve focused on research during your PhD time, that you’ve worked with Important People, that you’ve at least submitted a paper to a journal that they consider an A journal (i.e., a top journal in the field), and that your PhD comes from a serious research department such that it won’t be hard to explain to their colleagues from other disciplines why they hired someone with a PhD from that school. Teaching departments want to see that you’ve taught effectively and that you aren’t a research person. The latter point is interesting. Teaching schools will refuse to go forward with you in their process if they perceive that you’re using them as a fall-back in case the research schools don’t come calling. To that end, they’re pretty indifferent toward your publication goals (you still have to publish, but often lower-tier journals and conferences are sufficient to make tenure) and may prefer that your PhD comes from a less-researchy (and, thus, less well-regarded) school. If your PhD comes from a research school and you want a job at a teaching school, you’ll probably have to fight to get them to believe that you really want their job. Word-of-mouth is also a big fit-signal. Networking is highly important in the job market. Faculty advisors in particular can play very important roles in getting you known, getting you interviewed, and convincing hiring committees of your appropriateness and competence. It’s also pretty common for new PhDs to get jobs at schools where there are current faculty who also received a PhD from that school. For how many and for which jobs should one apply? Having gone through the process, I don’t think there’s any reason to apply for a job that you won’t get. In other words, you need to have some angle by which your getting a given job will make sense to the hiring committee, keeping in mind that what they’re looking for is a fit for *them*. If all you’ve done is behavioral research, there’s probably no point in applying to an econometrics school and vice versa. If you’ve focused entirely on teaching during your PhD, you can probably skip the research schools. While the marginal cost of applying to an additional school is low-ish, if you’re going to bother in the first place to send one, then you should bother to tailor it to the school. Further, given that many schools aren’t very selective about the candidates they preliminarily interview, it’s worthwhile to consider that those interviews take a toll, especially when they get stacked together on the same day at a conference. Further, they’re going to be a distraction from the schools where you have an actual chance at getting the position. If School X is a good fit, but you’re worn out from interviews with Schools A, B, and C, you’re less likely to impress School X (by, for instance, having a good idea about their MBA programs, knowing who on faculty researches what, etc.). IMHO, focus on the good-fitting schools and don’t bother with the others. I ended up applying for 15 jobs. I’ve heard of people applying to 60 or more. Of the 15 to which I applied, there were probably five or six I could/should have skipped. For instance, I applied to the University of Washington because I’m from the Seattle area, my parents still live there, and I’d love to live there again myself. However, the faculty are all econometricians, so it was never likely to work out (although I had a preliminary interview with them and they were cool/nice/interesting people). Just because the location was a good fit for me, that didn’t make me a good fit for the department (or, really, the department for me). There were probably also another five or six for which I would/should have applied, but didn’t due to geographic preference. How soon after a job is posted do you need to apply? Immediately would be good. Based on my own experience, I think there are a number of schools who stop looking at applications not submitted within the first week or so after a job was posted. There are also a lot of “inside jobs”, where a school already knows the candidate they want to hire and the application process is just a formality to comply with the law or the dictates of the HR department. I also got the impression that submitting an application close to the posted application deadline often results in your application not being reviewed, presumably because the school had already received enough worthwhile applications. Fortunately, once you have your application package (your stock cover letter, research statement, teaching statement, and CV), it’s not too difficult to customize your materials to meet the requirements of each individual school as soon as a posting is spotted. If you want to live in a certain city/state/region, will it work out? Depends on a lot of things. If there’s a school that’s hiring and for whom you’re the best candidate in that city/state/region… eh, you know. This wouldn’t be a good thing to count on happening, at least not on your first-choice terms. If you absolutely have to be in Location X, it can work, but you may have to be willing to make a lot of sacrifices on the job characteristics (e.g., smaller school, lower pay, heavy teaching requirements, non-tenure track, etc.). When I started my PhD program, my top criterion for a job was to end up on the west coast and it didn’t matter what kind of school it turned out to be. That perspective evolved considerably, especially once I started in on the preliminary interviews, to where the main criterion became the job itself and my preference for a very high research school with a PhD program. At that point, the west coast became particularly difficult. There are not a lot of top-tier research universities in the west that have IS departments, let alone very good IS departments. At one point I counted about 15 of these in a “West” that included every state (and province) in the Pacific and Mountain time zones (a large area). Further, not all of these 15 were good fits for me from a research interest perspective — that number decreases to something like 3-5, depending on which rumors are true. Of those 3-5 schools, one had a job opening, but was looking for someone who had a publication record stronger than mine. Do the schools care about your pre-PhD background? Assuming we’re talking about work “in industry” prior to beginning your PhD program: some more than others. The information systems field sometimes lives in different parts of the university, though it’s usually in the business school. Given that I have an MBA myself and spent 10 years working in (corporate) online marketing (mostly) positions, this gave me a good story as to why I would connect well with business students. Research schools don’t always care that much about teaching competence, though, so I think this was generally viewed as more of a nice-to-have rather than anything super important. That said, not every department or job is the same. 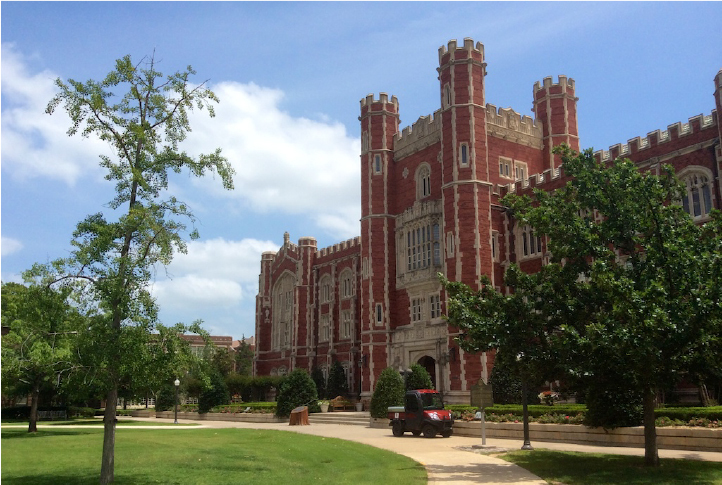 One of the things that was very attractive to me about the University of Oklahoma was the IS department’s involvement with the business community. For them, my background looked like it fit well with their objectives to build and strengthen those ties. For me, I liked the idea that my pre-PhD background mattered and could be used to some positive end for which there were already established structures. How did you decide what kind of job you wanted? As mentioned, this evolved a lot during the interview and job search process. I’m not sure how I would have come to satisfying decisions here without going through the process the way I did. I applied to a variety of schools at the outset, including some that were more teaching-oriented. I did preliminary interviews with these schools to understand what they were about and draw my own conclusions about how they were or were not good fits. I also was able to interview early on with one highly prestigious research school. Being able to compare those experiences helped me understand the differences and what those differences would me to me far better than anything else could have. While, as it turned out, I probably didn’t need to spend the time applying to the teaching and mid-seriousness research schools, or the time and money to attend AMCIS, I think it was probably worth it from an information-gathering standpoint. What’s the appropriate way to conclude this kind of post?